The student council of the North Side school hosted the Mayoral Forum in partnership with Kids For Candidates, a nonprofit that empowers students to practice compassion and advocacy through political awareness. Although all mayoral candidates were invited to participate, only three – Bob Fioretti, Paul Vallas and Willie Wilson – attended. 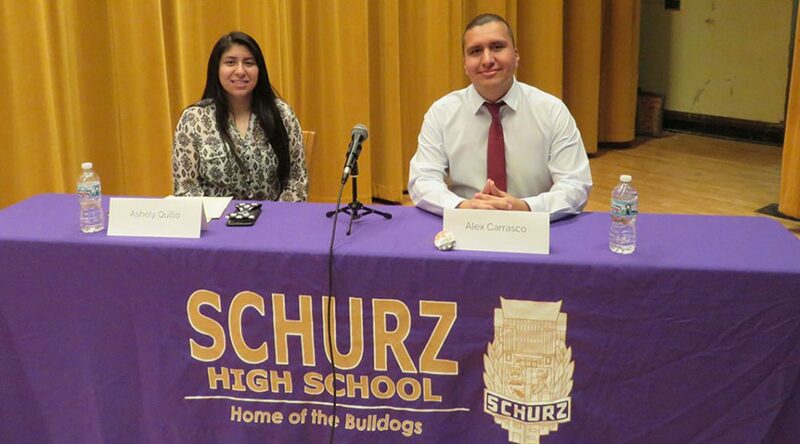 The student council asked students to submit potential questions for the candidates, and the questions the council ultimately chose focused issues ranging from animal cruelty and tax increases to violence in schools and immigrant protection. “How do you plan to address and prevent gun violence?” one chosen question read. “There’s so substitute for economic opportunity” to reduce violence, Vallas answered. The forum provided a unique opportunity for students to engage in city politics. Although the candidates held similar stances on most issues, such as protecting immigrants and curbing violence, many students left the forum expressing support for Vallas, who emphasized community and economic development in his responses. Vallas is the former CEO of Chicago Public Schools, including Schurz High School. Fioretti is the former 2nd Ward Alderman and former 2nd Ward Democratic Committeeman. Wilson is the current Chairman of the Trustee Board of Chicago Baptist Institute, and he previously ran for mayor in 2015. For example, when Carrasco asked the candidates how they would eliminate violence in schools, Vallas outlined a three-part plan, which would allow juniors and seniors to enroll in college courses early, implement a work-study program so students can gain valuable experience while earning money and restore public school patrol, where officers are trained to interact with students and students have access to a 24-hour hotline to express their concerns.